Treasure Nile is a 5 reel, 9 line progressive slot by Microgaming. It was the first 9 line game that Microgaming released and has been a popular pick ever since. The progressive starts at 40,000 and max bet is 4.50 per spin. 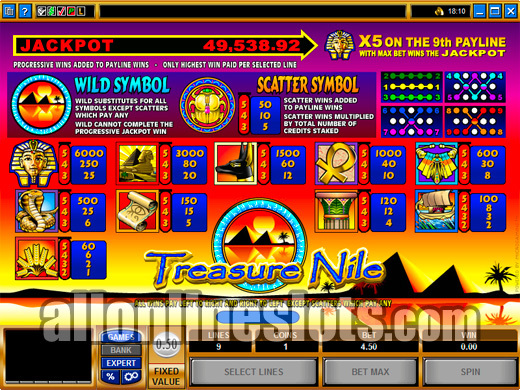 Treasure Nile was the first five reel, nine line slot machine that Microgaming released. 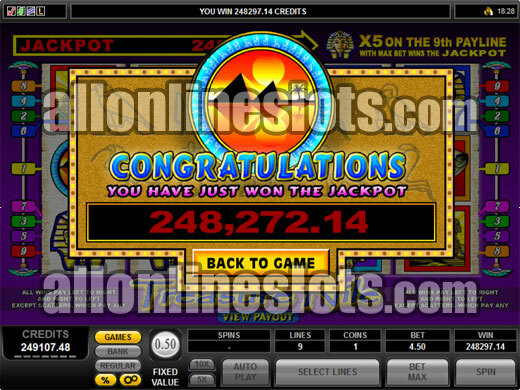 It was instantly a big hit with players and has remained one of the Internet's most popular and regularly hit jackpot. With a fixed coin size of 50 cents and a max bet of nine coins you are looking at a $4.50 maximum bet if you want to win the jackpot. The progressive starts at $40,000 so even the base prize is a very nice win for a $4.50 bet. In reality the average jackpot is around $60,000 and the highest ever jackpot won on Treasure Nile was a massive $520,625.09. As the name suggests, Treasure Nile has an Egyptian theme. Symbols include the gold pharaoh, wild pyramid, sphinx, scarab scatter and other related objects. 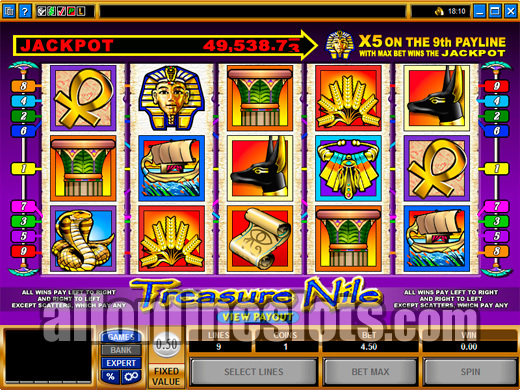 Treasure Nile has a total of 35 winning combinations which can pay left to right or right to left. This effectively doubles the amount of ways to win on each spin. The wild pyramid symbol substitutes for all other symbols except the scattered scarab. Interestingly enough there is no separate pay for five wilds. 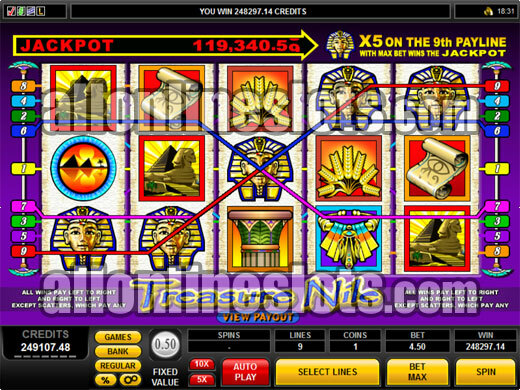 If you hit five wild symbols on a line you get the pay for five pharaohs which is the highest jackpot apart from the progressive and pays a handy $3,000. To win the progressive jackpot you need to hit the five gold pharaohs on the ninth pay line while playing max bet. It has to be five of the same symbols with no wilds allowed as part of the jackpot combination. If you have one wild in the combo you get the $3,000 instead of the progressive. Be sure to always play max bet to avoid any chance of hitting the winning combination and not having a bet on the line! Treasure Nile was also the first game online to feature a scatter symbol. The scarab pays for three or more anywhere on the reels which pays 5 times your bet or up to 50 times ($225) your bet for hitting five of them. Overall Treasure Nile is an example of how an online progressive should be. It offers some huge jackpots starting at $40,000 and also features enough good pays on the reels to keep you going while chasing the big win.